Zombie 99 Cent Special -- Offer Ends November 8th! This Halloween season, fill your book buying "trick or treat" bag with Enslow Publishers' e-books! As an introduction to our Speeding Star: Keep Boys Reading! imprint, we're offering the e-book version of Book 1 of our four-title "Zombie Zappers" series -- Zombie Camp -- for 99 cents! Zombie Camp presents author Nadia Higgins' playful 64-page tale of young adventurers encountering the living dead. Her age-appropriate storytelling style embraces language suitable for children while avoiding graphic violence. The book also provides a character development focus as the kids in the story learn a valuable life lesson. 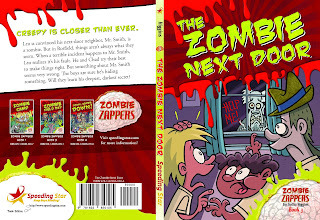 The "Zombie Zappers" fiction series is included in Enslow's new Speeding Star: Keep Boys Reading! imprint. Speeding Star's mission is to publish easy-to-read, high-quality fiction and informational texts suitable for boys from third grade through high school. "Speeding Star" books are currently available in e-book format as well as trade hardcover editions. 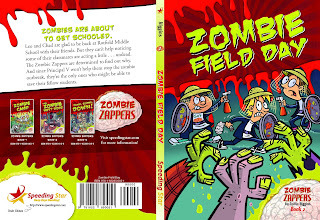 Zombie Camp, other Speeding Star titles, and many other Enslow Publishers' K-12 nonfiction books are available via bn.com, amazon.com, and other retail e-book sellers. Act now: Enslow's 99 cent offer for Zombie Camp ends on Friday, November 8, 2013! This Halloween season, Enslow Publishers' "trick or treat" bag contains a special discount incentive for e-book readers: we're offering Book 1 of our four-title "Zombie Zappers" series -- Zombie Camp -- for 99 cents! 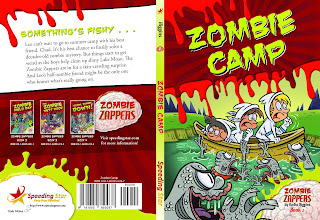 Zombie Camp, other Speeding Star titles, and many other Enslow Publishers' K-12 nonfiction books are available via bn.com, amazon.com, and other retail e-book sellers. Act now: Enslow's 99 cent offer for Zombie Camp ends on November 8, 2013! 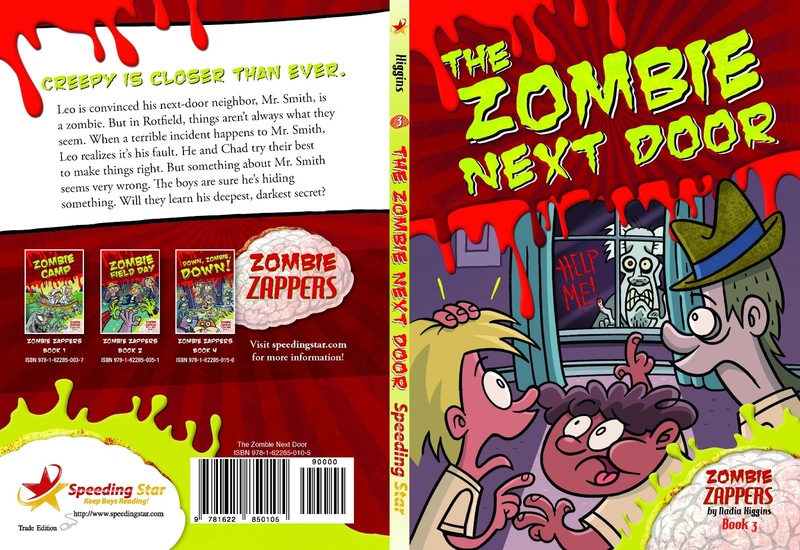 Nadia Higgins is the author of a new four-book series, Zombie Zappers, that will be published this fall under our new trade imprint, Speeding Star. 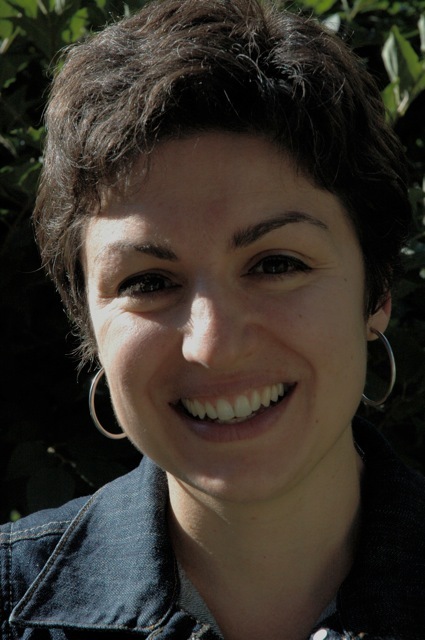 Thanks to authors like Nadia, beginning in the fall of 2013, Speeding Star will be providing easy-to-read books on topics of high interest in an effort to keep boys and young men reading. Now on with the interview! 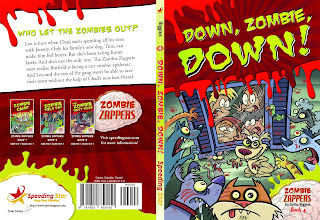 How is the Zombie Zappers series different from other books you’ve written? Well, put it this way. The last fiction series I did was a set of six fractured fairy tales ... the covers were light purple with fancy cursive writing. I also write 10-15 nonfiction school library books a year. What kinds of research did you have to do in order to write a series about zombies? I read every zombie book for kids I could find. I scoured the Internet and eavesdropped on zombie chat groups. The most fun was watching zombie movies with my husband every weekend. I think I was the first person ever to take notes while watching Night of the Living Dead. I didn't want to forget ideas that popped into my head while I was watching. So I'd scribble notes like, "Zombies as pets? ... Animal zombies? .... Strategy: pretend to be a zombie to escape zombies." What types of things did you make sure you included in the Zombie Zapper series? What types of things did you try to avoid? I have two kids of my own and we read together every night. So, in other words, I have read every kind of children's book out there with my own personal test audience. The books that we enjoy the most have a few things in common. One of them is that the protagonists are whip smart and wildly imaginative. They make mistakes, sure, but they almost always solve their problems on their own. That's what I was going for as I developed the main characters. As far as what to avoid--two things: stereotypes and that snarky tone you see out there a lot in dialogue for this age group. Why do you think kids are so fascinated by zombies? What an interesting question. The gross-out factor is big, for sure. But I also think zombie combat is more interesting than other kinds of monster battles. It requires more strategy and wit. Then there are so many awesome questions to ponder: how to reverse a zombie back to a human, how to tame a zombie, how to survive a zombie apocalypse . . . Zombies are a fun-scary way to think about life-and-death questions. One of the main characters, Roger, is Leo’s secret half-zombie friend living in his bedroom closet. What challenges does being friends with a half-zombie have? Ha! Well, for one, you have to make sure that none of your friend's body parts accidentally fall off in public. Neighbors tend to get freaked out by stuff like that. Zombie hunting is what bring these characters together but what is the real central theme readers will find in each of these books? In addition to the zombie action, each book explores a theme about relationships. In Next-Door Zombie, for example, Leo blogs some lies about his next-door neighbor. His thoughtless remarks have serious consequences, and he needs to find a way to make things right. What does it feel like when your best friend gets another good friend? What about when a friend takes credit for your work? How does it feel to be left out? These are some of the basic issues that the set explores. Do you suspect that there are any zombies living in your neighborhood? Yes--my kids when I try to wake them up in the morning! What advice would you give kids if they ever meet a zombie on the street? Whatever you don't, don't scream! That draws the hordes. Remember that you are a lot faster and smarter than zombies. You'll have to use your wits to outsmart them. Also, adults are rarely helpful during a zombie outbreak. It's up to you, kid! Nadia Higgins is the author of more than sixty books for children. 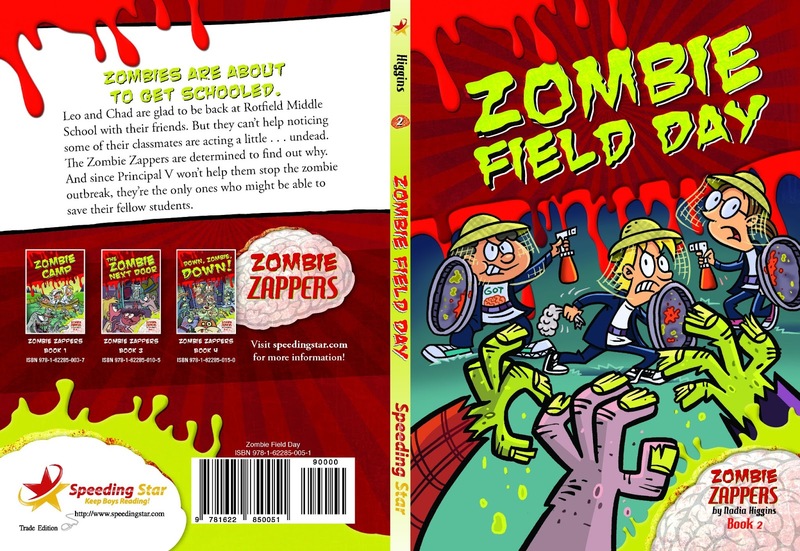 In addition to Zombie Zappers, her fiction includes Fiona and Frieda's Fairy-tale Adventures and a series of comical picture books, Barnacle Barb and Her Pirate Crew. She lives in Minneapolis, Minnesota, with her husband, two daughters, and their "guard" fish, Marie. 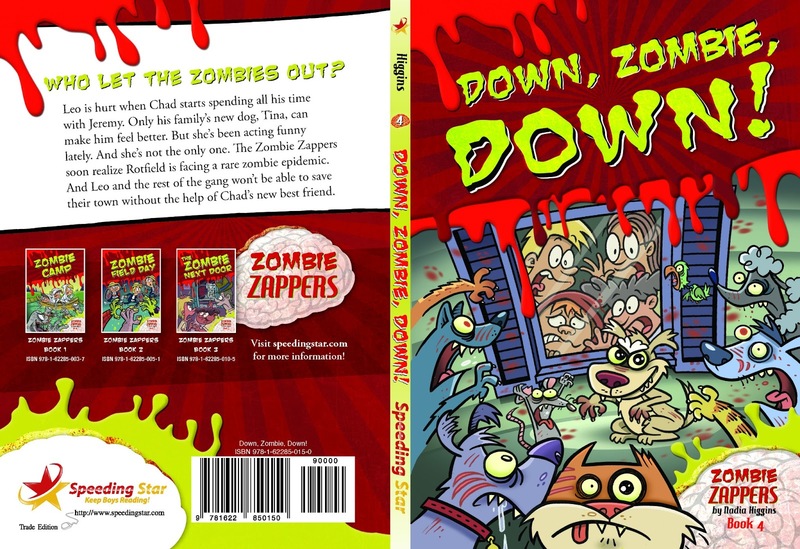 Please note: Members of the media who wish to review Zombie Zappers may request advanced reader copies by sending an email to: customerservice@enslow.com.